The Frugal Burqueño: Put your creative cap on and design a new distribution box for the Alibi! Put your creative cap on and design a new distribution box for the Alibi! When I read about this arty contest I thought it was a very cool idea! (yay for Summer Olsson!) The old Alibi boxes could definitey use a makeover and if your proposal is chosen, you can be the author of a new piece of art that will make Albuquerque a more beautiful place. "Here’s how it goes: Send in your proposal for what you would do to an Alibi box—paint it with goldfish, collage it, glue things to it, whatever. If possible, include a photo or a sketch of your idea, or a sample of your previous work." They'll choose12 ideas, give the winners money for supplies and drop a box off at their homes. Three weeks later the art-ified boxes will be picked up and put along the Central corridor. 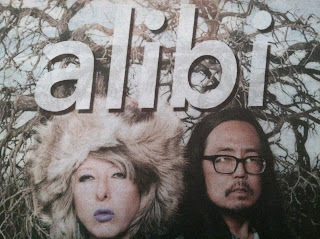 The Alibi will create an audio walking tour that can be downloaded from their website! So good luck and hurry! One more day left for submitions! Details here. Do you like creative contests? Have you won any? This sounds like so much fun, but I'm having trouble coming up with anything that's realistic--I keep thinking "stained glass" but I'm not sure that's practical for something that probably needs to stand up to a bit of a beating. I am sure our fellow Burqueños will come up with cool ideas :)yay for creativity!